As a nervous nail bitter, my cuticles are saved because of this cream. This lemon cream is infused with sweet almond oil, cocoa seed butter, vitamin E and sunflower oil. The cream goes on smoothly and softens cuticles quickly. I love how well-manicured this cuticle cream makes my hands look. It is a nice cheap organic way to pamper myself. I love the sweet scent of this conditioner. While the peppermint overpowers the honey scent it still has a quite delicious scent. My hair feels soft and full of luster after one use. The conditioner does cause a tingly sensation, but it was quite relaxing. I love massaging this conditioner into my head. After finishing your entire to do list for the week, the last thing you want to do is anything else. Taking some time to indulge in you is what the body, mind and soul needs. A bath is the best way to unwind and renew your senses. 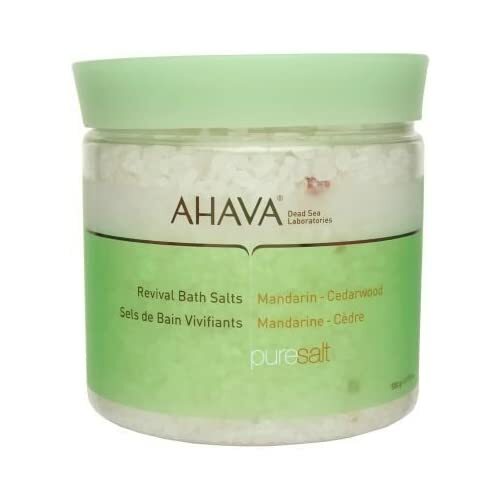 I have used Ahava products for a while but I have not noticed anything special about them. These bath salts have changed my perceptions about this brand. The citrus scent is invigorating and the scent lingers long after my bath finished. My skin was left soft and smooth. I can’t wait until my next bath! While having dark skin has its perks, it does get annoying when you get a breakout. Boy, those dark spots don’t ever go away. I read a couple of reviews about this lotion and I couldn’t wait to try it. This creamy lotion left my skin soft, dewy and supple. I also noticed that after 2 weeks of use my dark spots have started looking less noticeable even if they have not completely disappeared. I have used their eye cream and was quite taken with the results. I needed a new moisturizer and this was on sale. Oye! Now, I know why this was on sale. The formula was greasy and had a chemical smell. The lotion went on smoothly but it left a white film on my skin. It also left my skin feeling dry and sticky. I have not gotten chance to use the other products and probably will not be willing to try them now. I never knew this brand even existed until randomly looking for a new lipstick to try. I wanted to give the pink lip trend a go. While this bubblegum pink looks pretty on the screen, it became a fluorescent pink. I thought if I walked into a dark room, my lips would glow in the dark. While the cotton candy color is not for me, I love the lipstick in general. The creamy lipstick goes on smoothly and makes my lips really soft. The formula itself is very long lasting and left a nice pinkish tint after the lipstick wore away. I can’t wait to try the other colors in this line, most especially the Glamour101 from the Lip Noir line. It seems every consumer commodity is coming out with a luxe version. Hand sanitizers are no different when joining the fray. Frais hand sanitizer is known as the luxury hand sanitizer and is packed with essential oils and is sugarcane alcohol based. The hand sanitizer moisturized my hands more than the regular triclosan and alcohol based sanitizers. It smells refreshing thanks to the ginger, tangerine, grapefruit, basil, and lemon myrtle. While I do like this hand sanitizer it leaves my hand feeling a bit sticky [not as bad as sticky candy] after using, just like Purell.